Welcome to our ongoing Game In Progress coverage of Torment: Tides Of Numenera. 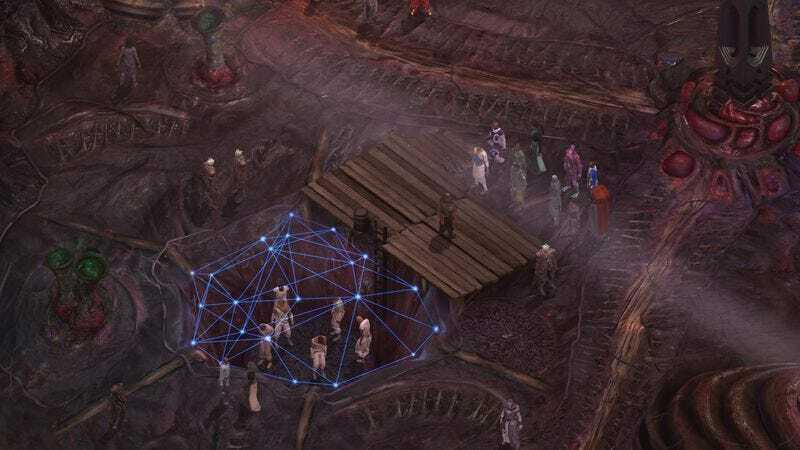 Over the past several weeks, William Hughes has been making his way through InXile’s ambitious spiritual sequel to cult-classic RPG Planescape Torment. This third and final installment covers everything from The Last Castoff’s escape from Miel Avest to the end of the game. When last we left The Last Castoff, they had just barely escaped The Sorrow’s attack on Miel Avest, the Eden-like sanctuary where their fellow godlings futilely hid from their implacable tentacled pursuer. Fleeing into a mysterious portal, they emerge into a realm of body horror and hunger, a living city feeding on the scavengers and predators it mercilessly sustains. Welcome to The Bloom. The Bloom—Tides’ final hub area—is different from the generic, characterless locations that came before it, and not just because it literally is a character: a vast beast manipulating the various crime lords, time-tossed survivors, and cheerful scavengers living inside it in its vicious favor. A cross between an inter-dimensional swap meet and the works of H.R. Giger, its impact is felt in more than just the background art, which amply sells the grossness of living in a festering biological hell full of teeth and hideously grasping tongues. No, The Bloom works because it has a thesis, one that ties into that question we talked about up top: Everything has a cost. That idea is expressed most nakedly in the Maws, the hungry mouths that act as bloody analogues to Planescape’s Sigil and its multiverse-spanning portals. Maws transport people through time and space, but as their name suggests, they won’t do anything until they’ve been fed—fed emotions or fed people, but always fed something it’ll be painful for the player to lose. Much of Tides’ final chapter is spent opening these gluttonous orifices, and each time a new one reveals itself, an ugly choice opens up right along with it. Give it yourself? Give it your friends? Give it a slave you bought on the auction block? Try to take a third option and cut it open by force? These are all valid choices, and they all carry costs, moral and otherwise. There is no easy, clever response that gets you (or it) a free lunch. Just that question. What are you willing to give up? The Last Castoff’s time in The Bloom is an ongoing negotiation, a perpetual test of who the player believes their character to be. At the same time, the game’s always-precarious balance of resources tightens up even further, such that every act of self-sacrifice isn’t just a meaningless gesture, but a real impediment to later success. If I offer myself up to a Maw now, what’ll happen if I’m ambushed in my weakened state? If I manipulate the Tides to ease someone’s pain, will the added burden make me falter in a later fight? More than any artificially imposed system, decisions like these are the ones that define The Last Castoff’s morality, and it’s in engineering an unnatural location that naturally forces decisions to happen that Tides gives itself a setting worthy of standing among the greats in the Western RPG canon. Take, for instance, the resolution for Rhin, the little girl we (potentially) picked up back in Sagus Cliffs and the most compelling of the game’s companion characters. Rhin’s character works because, despite the secrets she’s hiding, she really is exactly what she seems: a small child who’s been hurt by the world and needs The Last Castoff to keep her safe. It all comes to a head in The Bloom, where you’re offered a chance to get her back home, the one thing she truly wants. The procedure is costly, as the portal-maker feeds on your other party members’ affection for you, but if you’re the kind of player willing to take Rhin this far—protecting her in fights, denying yourself better combatants, curbing your cruelty in front of her—there’s deep satisfaction in finally getting her back to safety. It’s a simple story amid all the lost memories, hungry gods, and cosmic monsters that the game offers up, but a powerful one nonetheless. Some of that power ebbs away once your sacrificial errand-running is complete, and Tides barrels forward into its abrupt endgame. After confronting so many human costs so elegantly, it’s a let-down when the game veers back into abstract, distant discussions of legacies and the long-term costs of abusing the Tides. Despite all the build-up, the player’s final decision for the fate of the world—and the standard “Here’s what happened to everybody” text-walls that follow—barely registers. Worse, Tides falls into a common trap for RPGs of the thoughtful, non-confrontational type, with a final challenge that’s a functional anti-climax where players can easily talk their way to any desired outcome. It’s a hypothetically nice reward for careful investigation, examination, and understanding of the story, but in practice, it robs the game of a satisfying punch when the Big Bad gives up the ghost after three or four clever dialogue prompts. Talking the monster to death isn’t inherently bad, but it should feel as weighty and as difficult as, say, talking down The Transcendent One at the end of Planescape Torment. There’s also the unavoidable issue of bugs. While I never encountered an actual game-breaking glitch during my 30-odd hours with Tides, I ran into at least two that fully blocked progress down optional paths. The most galling of these came here in the endgame, where it disabled a key location and stopped me from getting a good ending for one of my companions. InXile promises that it’s working to fix these—including the specific one that got in my way—but it’s still as aggravating as if I were reading a novel and suddenly found a bunch of torn-out pages in the middle of the climax. The glitches are rare, but not rare enough, and their impact on pacing and pleasure can’t be ignored. But for all these problems, technical, structural, and otherwise, I still couldn’t imagine waving anyone who enjoys thoughtful, literate games away from Torment: Tides Of Numenera. There are just so many rich characters to meet here, so many wonderfully written short stories to be immersed in, that it would be criminal for fans of this style to pass them up. Across 30 hours, I explored every screen with a fanatic’s fervor, unsure what I’d find or where I’d be taken the next time I dropped into conversation with the game’s diverse menagerie of people, creatures, monsters, and gods. As a long-form piece of storytelling, it struggles and frequently fails. But as a world to explore, a trove of interesting choices, a collection of characters and quests, it’s a treasure that I’ll sorely miss. In many ways, it surpasses its predecessor, even if it can’t match Planescape’s mastery of its overall narrative arc. Instead, Tides Of Numenera is a masterpiece of short-form storytelling, of minute-to-minute joys and indelible individual moments. But a masterpiece, nevertheless. Speaking of maxing out my level, I was somewhat disappointed that the game stops at Tier 4. Leveling up in Tides is pleasantly empowering, and I missed it for the last few hours of the game. My final party: Tybir—who finished the game hating me, thanks to my hard-assed resolution of his personal quest—prickly assassin Matkina, and the gruff Aligren, who could never catch up power-wise after spending most of the game on the bench in favor of Rhin. Also, I just now discovered that Rhin’s character was written by Kingkiller Chronicle author Patrick Rothfuss. Given how much I enjoyed her, and have enjoyed Rothfuss’ books, that makes sense. Things I’m kicking myself for: Not realizing that the Bronze Sphere you pick up early on isn’t just a Planescape shout-out, but a tool that lets you swap companions in and out of the party at a distance. Also, missing one whole party member, Erritis, whose story sounds fascinating from what I’ve read online. Favorite unimportant NPCs: Sundermun the Elder and Sundermun the Younger, a perfect example of how good writing and clever ideas can liven up an otherwise boring and generic NPC vendor. And that’s it! Thanks for playing along. I hope you enjoyed your time with me, exploring out Beyond the Beyond.